Keep your hair tights with our trendy headbands. If you want colorful headbands in affordable price then we are here to offer pretty colored headbands at pocket friendly price. Dry wicking. Anti-microbial. StretchFlex technology provides lasting recovery and a great fit. 2" wide headband finished with flatlock stitch. Standard basketball hoop netting. Patented design. 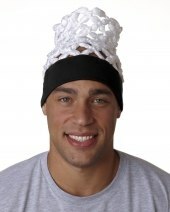 Sweatband can be screen printed or embroidered.